What is Dark Matter and where is it found? These are two of the major mysteries in current studies of the Universe. Although the nature of this invisible material remains elusive, astronomers are beginning to produce detailed maps of the Cosmos, showing its location in relation to the ordinary matter that we can see in telescopes. 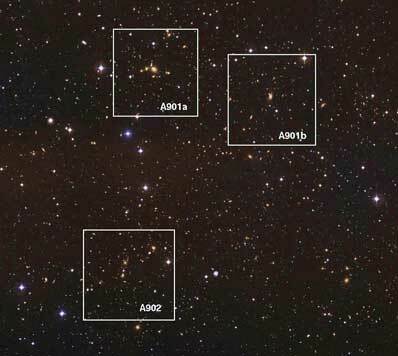 The A901/902 Supercluster system by ESO/MPG Wide-Field Imager. One of the world leaders in this research is Dr. Andrew Taylor (Royal Observatory, Edinburgh), who presented the most accurate image ever obtained of the Dark Matter in a galactic supercluster at the UK National Astronomy Meeting in Bristol on Wednesday. "Ultimately we hope that the detection of a Dark Matter particle in a laboratory will reveal its true nature and place in physics," said Dr. Taylor. "But at the moment our only guide to the properties of the Dark Matter is from Cosmology." The method used by Taylor, a PPARC Advanced Fellow, Dr. Meghan Gray, then a student at the Institute of Astronomy in Cambridge, and co-workers in Heidelberg and Imperial College London, is to take advantage of gravitational lensing, when light from a distant galaxy is bent by the gravitational field of matter in front of it. Such gravitational lenses provide a direct probe of where Dark Matter is in the Universe. Edinburgh has long been at the forefront of developing and applying methods of using gravitational lensing to image the two-dimensional distribution of Dark Matter and so study its properties. We can see from the image above that the dark matter (contours) agrees fairly well overall with the light from the supercluster galaxies (colours), with three large clumps of matter corresponding to the three galaxy clusters in the top image.� However, we also see bridges, or 'filaments', of dark matter connecting the galaxy clusters, thus verifying predictions from theories of dark matter that the Universe is a network of clumps and filaments. In other words, our Universe is one big 'Cosmic Web'. In a recent study, Taylor and his colleagues have made the most detailed analysis yet of the Dark Matter in the Abell 901/2 supercluster, one of the largest structures in the Universe. The enormous structure, some 10 million light years across, contains a group of galaxy clusters known as Abell 901a, 901b and Abell 902. Their image of the Dark Matter, which covers an area of sky the size of the full Moon, was obtained by analysing the gravitationally lensed images of 50,000 galaxies. It shows that not only do the galaxies we see lie within larger Dark Matter clumps, but that these clumps are connected by "cosmic filaments" - bridges of Dark Matter connecting the clusters. The existence of these filaments has long been a prediction of the theory of Dark Matter in the Universe, which indicated that the matter in the Universe is distributed in an intricate network of clumps and filaments - the so-called Cosmic Web. More recently Taylor has developed a new method which will allow cosmologists for the first time to make fully three-dimensional images of the Dark Matter distribution in the Universe using gravitational lensing (Ref: Taylor, 2002, submitted to Phys Rev Lett, astro-ph/0111605). "Having 3-D images will allow cosmologists to put much better constraints on the nature of Dark Matter in the Universe," explained Taylor. 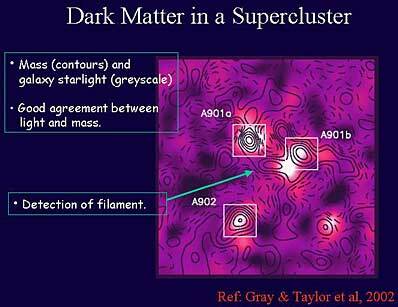 The existence of invisible Dark Matter has been determined from its gravitational pull on stars and galaxies. Calculations suggest that it fills the Universe, making up 80% of all of the matter in the Universe, and is five times more abundant than ordinary matter. When it clumps together it seeds the formation of galaxies. Its gravitational pull also holds together clusters of galaxies. Details of the supercluster research were published in the March 20th issue of the Astrophysical Journal. (Ref: Gray & Taylor et al, 2002, ApJ, 568, 141-162, astro-ph/0111288). The Royal Observatory, Edinburgh (ROE) comprises the UK Astronomy Technology Centre of the Particle Physics and Astronomy Research Council (PPARC), the Institute for Astronomy of the University of Edinburgh and the ROE Visitor Centre.